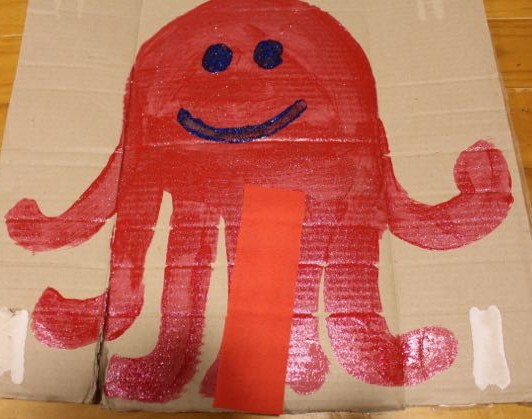 We made our own version of Pin the Tail on the Donkey for our beach themed party; Pin the Tentacle on the Octopus! 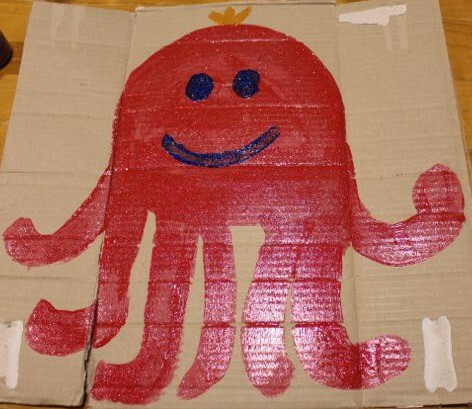 Using a piece of scrap cardboard, I painted an octopus with only seven tentacles. I gave her a lovely big smile, and A thought she should have a little crown too. We used some glittery paint for extra effect. While the octopus was drying we cut some lengths of crepe paper streamers up in various colours to use as the missing tentacle. 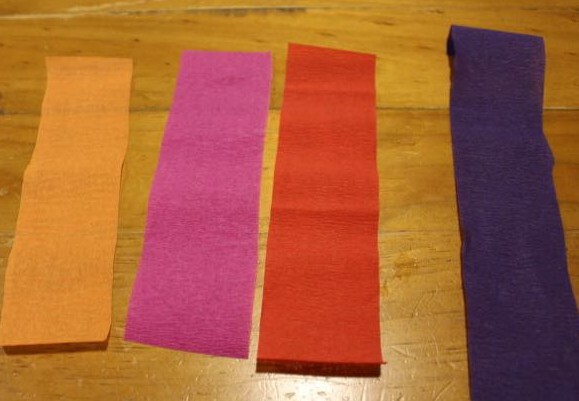 Each child could choose one, and using a piece of blu-tack on the back of the streamer, stick it to the octopus picture during the game. I’m sure most of you have played a version of this game at some point, but if not, it is played like this; each child stands in front of the picture, is then blind-folded and spun around gently three times before trying to stick or pin the tail/tentacle onto the picture. The child that gets their tentacle closest to where it’s meant to be is the winner. A scarf tied around the child’s eyes can suffice for a blindfold. Example of where to place the tentacle. This is a fun game for younger children and can be done with as many players as there are available tentacles (or tails). Recently we held a birthday party with a beach theme. As the centrepiece of the food table, I made cupcakes to place on my cupcake stand. My stand has three levels for holding cupcakes, plus a place for one right at the top. I used this design to make the cupcake stand into an island cupcake tower. 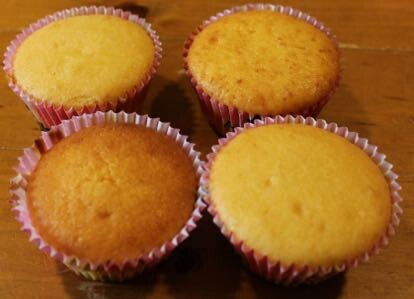 First, we baked the cupcakes using a basic butter cake mix. A helped me set out the paper cases (she chose ones with Disney Fairies on them! 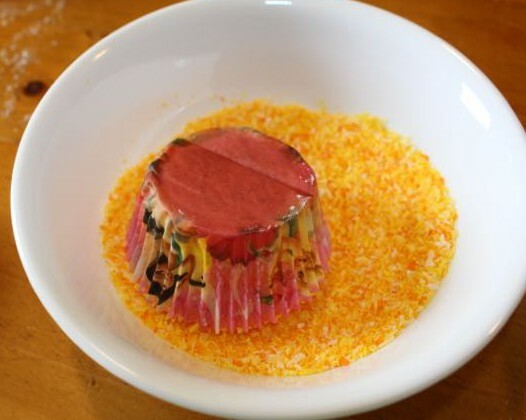 ), and spoon the mixture into the cases. We only filled each one about half way so that they didn’t rise too much. Once the cupcakes were completely cool, A and I divided the cupcakes into piles for each level on the stand. The lowest level held the most cupcakes, and was to represent the water of our island. A helped me mix up the butter (vienna) cream to ice them. I like to use a simple recipe for butter cream that I found on Taste.com. 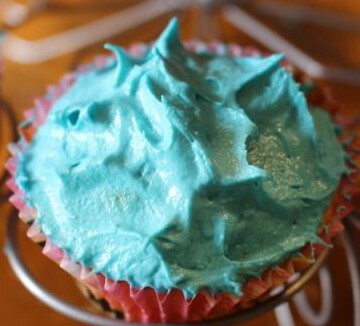 We added some blue food colouring to the butter cream until it was the blue we wanted, and then we generously covered the cupcakes with it. We used the flat edge of a knife to create the “waves” by tapping the top of each iced cupcake, pulling some of the butter cream up in peaks. Adding coconut to the top of the cupcake. We made a second batch of butter cream, this time colouring it yellow for our layer of sand cupcakes. 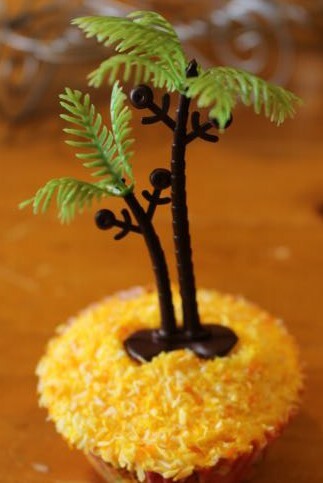 We had previously coloured coconut to use as the sand on these cupcakes. We covered each cupcake with butter cream, and then dipped them into the yellow coconut until the tops were completely covered. 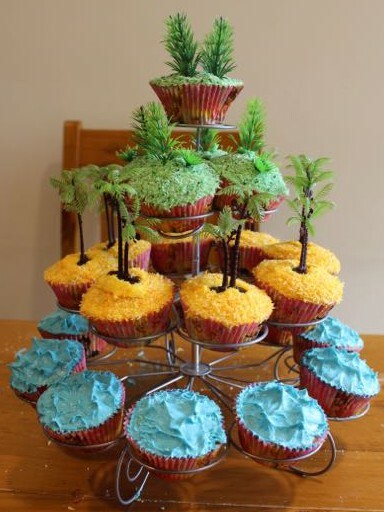 I made the butter cream thick on these cupcakes to help hold the plastic toy palm trees we then placed on each one. 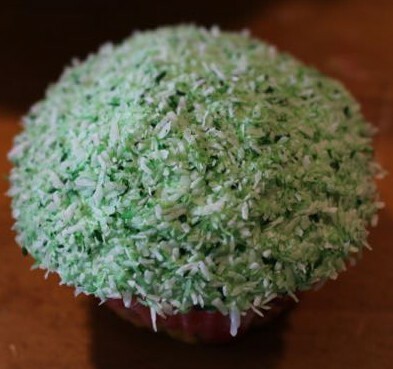 The final layer of cupcakes was to be the heart of the island, with green butter cream and green coconut for the grass. Again, we applied the butter cream generously to help secure the plastic ferns we added for foliage. These cupcakes were the pinnacle of the cupcake stand. 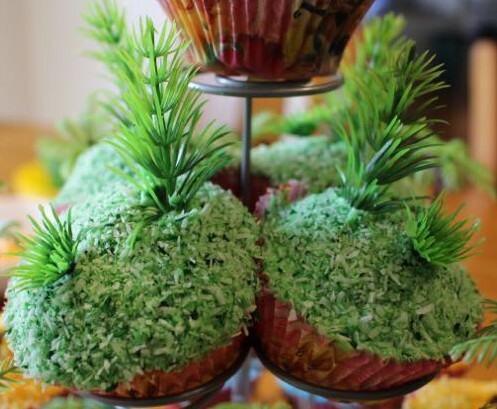 The cupcake on the very top was the centre of the island, which sloped down to the sea at the bottom. I think it looked quite effective on the table! It’s nice to have photos displayed around our home, but most of our frames are a little boring. I picked up some plain wooden photo frames in Bunnings that we could decorate any way we pleased. We made them into shell frames. First we gave the frames an undercoat of white acrylic paint. Both L and A got white paint everywhere, so I was glad we had the muck mat down. Painting the frames wasn’t vital, but I thought it would look better than the plain wood. Pressing the gluey frame into the sand. 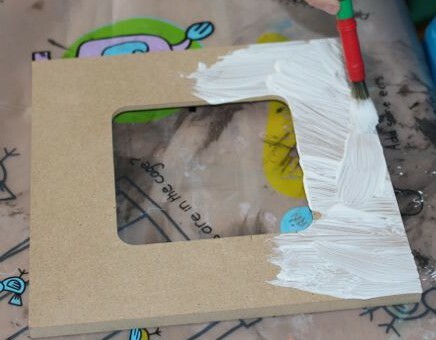 Once the paint was dry, the kids painted on a thick layer of PVC glue all over the front of the frame. 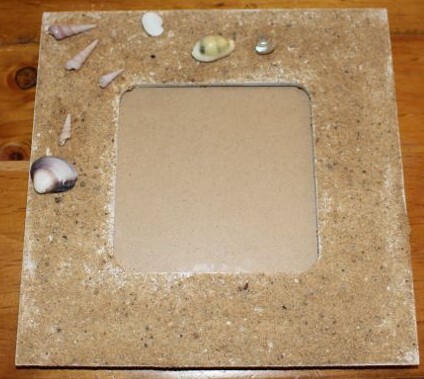 I had placed some clean sand (sandpit sand from Bunnings) into a tray big enough for the frames to be placed face-down into the sand. 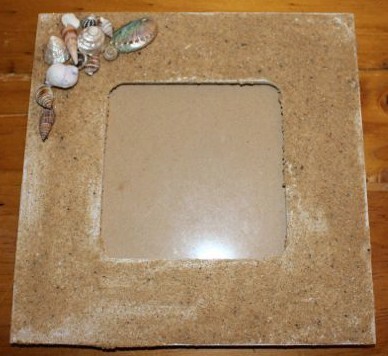 The kids took turns to put their glue-covered frames into the sand. 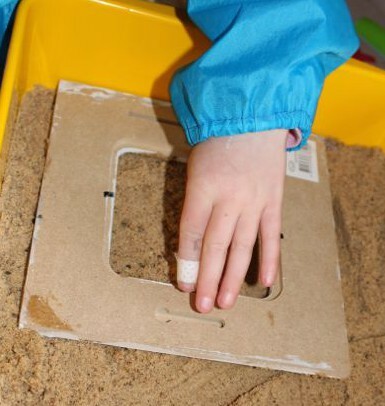 Just pressing the frame down into the sand was quite effective at getting the sand to stick to the glue. There was the occasional patch that didn’t have sand, but the kids just added a bit more glue and then sprinkled sand onto these places, and pressed the sand down. 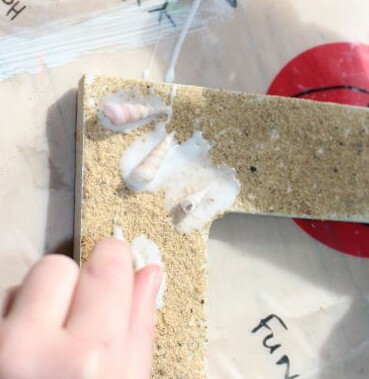 Adding glue to a shell. We left the sandy frames to dry for long time (due to damp weather), and then we shook off any excess sand that wasn’t stuck down. 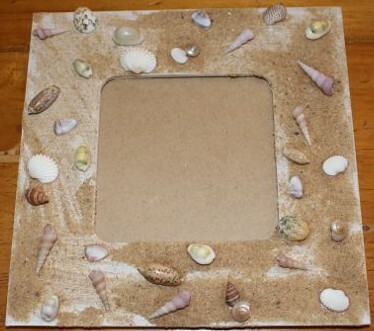 Now we used PVC glue to add some small sea shells to the frames. A put all of her shells together in one corner. 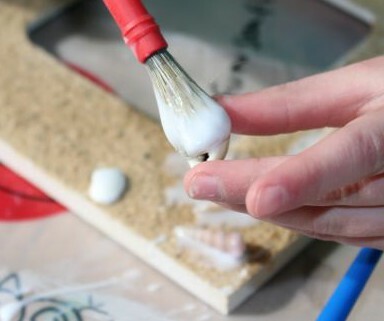 She used so much glue to place her shells, it took several days to dry completely. L placed just a few shells down two sides, while I added shells randomly all over the frame I decorated. These frames look very impressive, and they were fun to make. They will look even better once we get photos into them! Our pile of glitter and metallic glues. 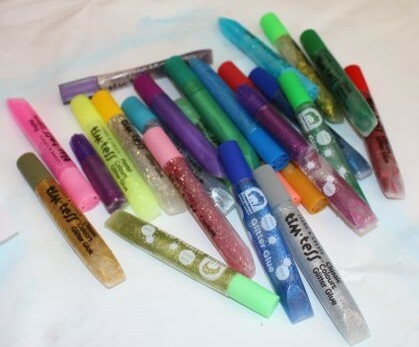 We have a tub of glitter glue and metallic glue tubes that the kids use on all sorts of projects. 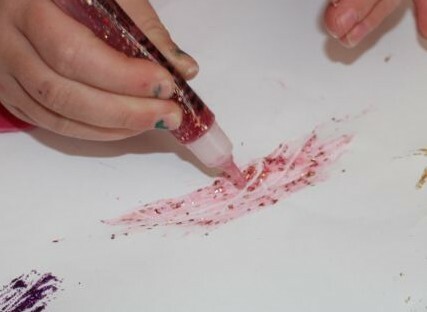 I like using glitter glue over glitter as it is generally less messy (unless A leans in it and then spreads it all over the place…or dangles her hair in it), and it’s easier to place exactly where we want it. The downside is that the kids (especially A) put it on so thick it takes ages to dry, and we often need to leave our projects at least overnight to dry. 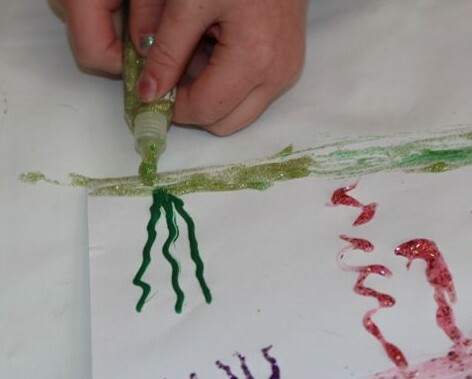 Today A used the glitter and metallic glues to draw a jellyfish picture. 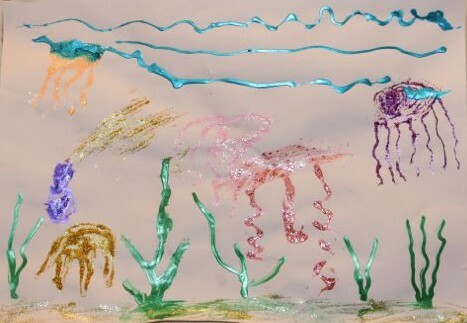 She started out painting fish, but they morphed into jellyfish. She also wanted to add an eel, but it grew tentacles and became a jellyfish too. She drew waves with some blue metallic glue, and sand with yellow glitter glue. There’s also some seaweed done in green metallic glue. I like how glittery this picture is. Drawing sand at the bottom of her picture. Both L and A have been fascinated by the ocean and its inhabitants for a while now. They want to read books on ocean creatures, watch ocean documentaries, do sea creature craft, and watch The Little Mermaid and Finding Nemo over and over and over… They also want some pet fish, but we just don’t have a good place where we could keep a fish tank at the moment, not with Baby T learning to climb on everything and pull things over. 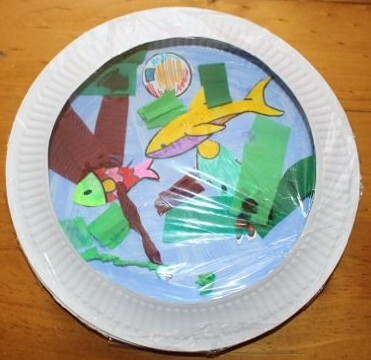 We improvised instead, and made some little aquariums using paper plates to hang in their rooms. 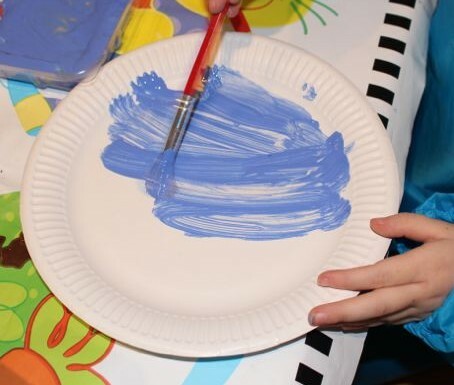 First, the kids painted one of the plates blue to represent the water in their aquariums. This was fairly quick, but of course, we had to wait until they were dry. While that happened, the kids started colouring in their sea creatures with markers. L only coloured in a few of her creatures, as she only wanted to make one aquarium, but as A wanted to make two, she coloured all of hers in. 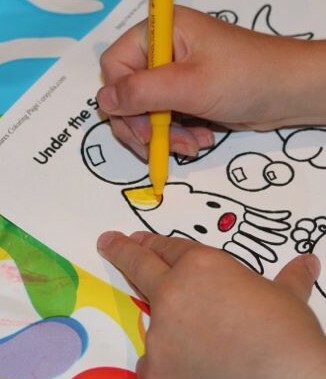 I found the undersea creatures to colour in on the Crayola site. There are lots of colouring pages available to print there. 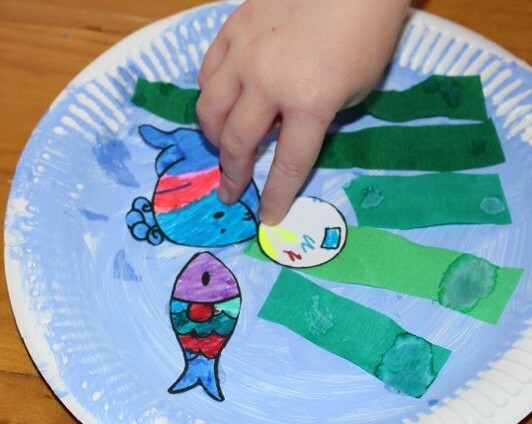 L cutting out her fish. 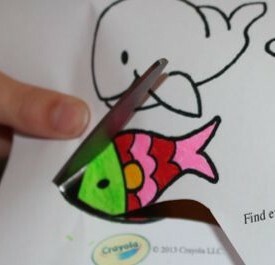 L only needed a little bit of help cutting her sea creatures out, but A asked me to do hers after she almost cut off the fish’s head. 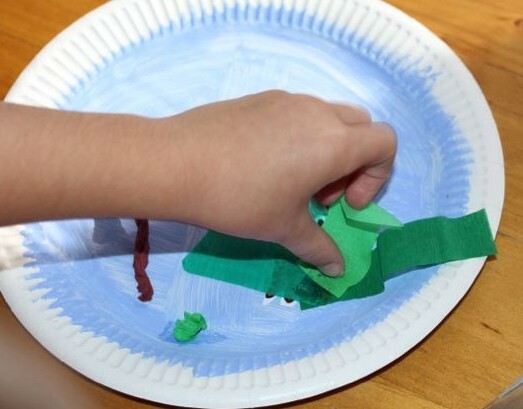 We used crepe paper to make sea weed, I just cut a few different green shades and some brown into strips. The kids glued some seaweed on, and then added their sea creatures. They both added some more strips of seaweed after this, making some of the animals appear to be hiding in the sea weed. This was their idea, and I love it. 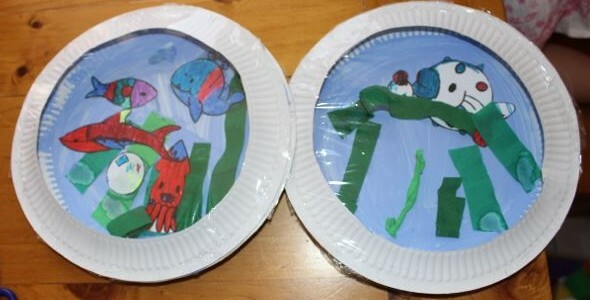 I made the lids for the aquariums using a second paper plate. I cut the centre out, leaving just the ridged bit around the edge. Then I taped some plastic cling wrap over the plate, creating a clear cover for the aquarium. We stuck the two paper plates together at the edges using tape, added some string to the top of each aquarium and hung them up.